It’s time to find a job and sit down to write your resume from scratch or give it the much-needed update. After trying your best to make your resume look professional either on Word or Pages, it still lacks that extra something. Why to spend hours trying to format a professional looking resume when you should be spending that time writing a job winning resume? Why to spend time setting your own fonts, indents, margins, borders, bullet points, bold text, underlines, and other elements to make your resume look professional? What is the point in wasting your time creating a ‘perfect’ layout when all that hard work has already been done for you? By using a pre-made resume template, you are reducing the risk of sending out a resume with plenty of formatting mistakes which are more common than you think and could reflect badly on you and all that hard work could get thrown away. Many applicants will still be using the typical monotone black and white resume, which just makes your premium resume template stand out from the crowd immediately. You have the chance to show your potential future employer how serious you are about being employed by them. It also shows that you’ve put some effort into your resume and it makes for a great first impression. So, what other reasons is there to use a premium resume templates? 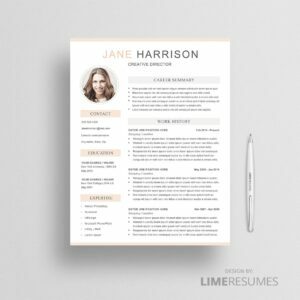 Resume templates are fantastic as they allow you to focus on the content while safe in the knowledge that the layout will impress. When it comes down to it, all you have done is use a resume template that someone else has created rather than you. It can help to put you in a stronger position to get the job. When we concentrate on getting the layout right, it is easy to forget the content but this will be at the forefront of your thinking with a ready-to-use resume template as they have been proven to work. A resume template works great as a checklist guiding you section by section with what to include; if you decide that a section isn’t needed or doesn’t apply, simply remove it. Recruiters understand that there are free resume templates available online. However, you should make your resume easy to read and highlight all important information. Premium resume templates are designed with this in mind. You have probably heard it too many times that resume templates make you stand out! But they do. Those free resume templates that you can find online are over used and tired looking and recruiters receive a ton of them. Recruiters sift through dozens and dozens of resumes, after a while they will all blend into one. What will you do to make sure that you get noticed? Templates are designed so that you can save time, after all you want to be working smarter not harder. Even certified resume writers use resume templates. If you are mostly applying online through forms there is still a time that you’ll need your paper resume and that is when you get invited to the interview. Always bring copies of your resume to the interview and hand each interviewer a copy of your resume. Online forms are mostly used by medium and large companies but it’s always good to have a PDF version of your resume handy whenever you’ll need to email it or print it. You might also need printed resume at career fairs and when networking. You can upload PDF version of your resume online. You can register a domain name and upload it there and add link to your business card or social media. Great thing about PDFs is that you can make it interactive and for example make links clickable. You can also upload your PDF resume to a cloud service like Dropbox and easily share your resume whenever and wherever. When you use free resume templates they don’t include support or help. At LimeResumes support is included with every purchase and we offer a satisfaction guarantee. Also our resume templates always come with a matching cover letter and reference page. Tip: our cover letter templates can also be used as a thank you letter. There was 8 great reasons on why you should be using a resume templates. Comment below if you got more great reasons on why to use resume templates or maybe you have questions about resume templates? When it comes to a resume template you should remember to personalize it to suit you. If you find a template that features something you don’t need in your resume, such as a resume objective section or a photo, you don’t have to rule it out. Resume templates are meant to be edited to your needs and are therefore fully editable. Ready to make your resume shine? We offer selection of resume templates from modern resumes to classic ATS-optimized resumes. This entry was posted in Advice and tagged Resume Design. Don't miss out on FREE access to our exclusive resource library & newsletter updates.